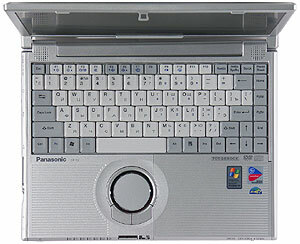 It should be noted that this model currently comes equipped with Pentium M LV 738 1.4 GHz with Intel PRO/Wireless 802.11ABG. The stamped display lid looks quite original. 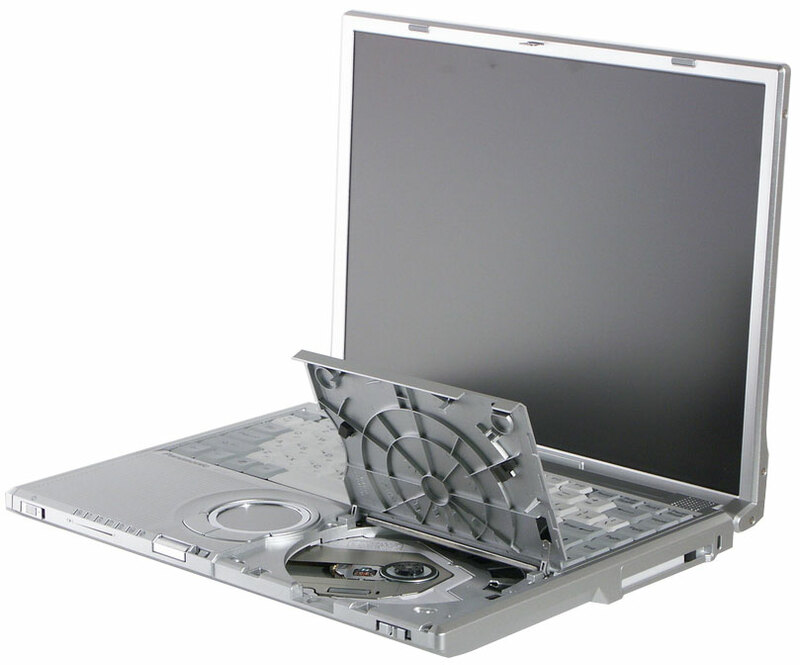 The entire case is made of magnesium alloy. 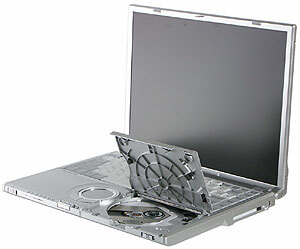 Together with a shock-mounted hard drive, it should provide extra durability for this notebook. 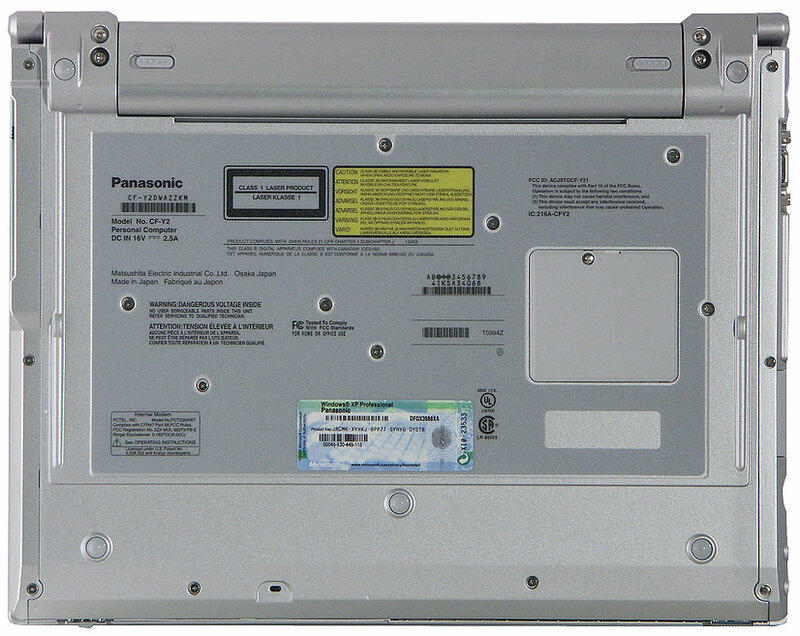 Battery is installed on the rear. 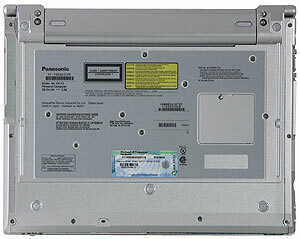 The front panel houses: a power slider (on the left), indicators, a display lid latch, and a sliding catch that opens or turns off the DVD/CD-RW drive. The layout of USB ports calls for comments — there are only two of them located behind RJ-45 and RJ-11, not a good location. If a network or modem cable is plugged to the notebook, it's very inconvenient to connect USB devices. But if no cables are plugged, this layout allows to connect even the bulkiest USB devices without adapters. 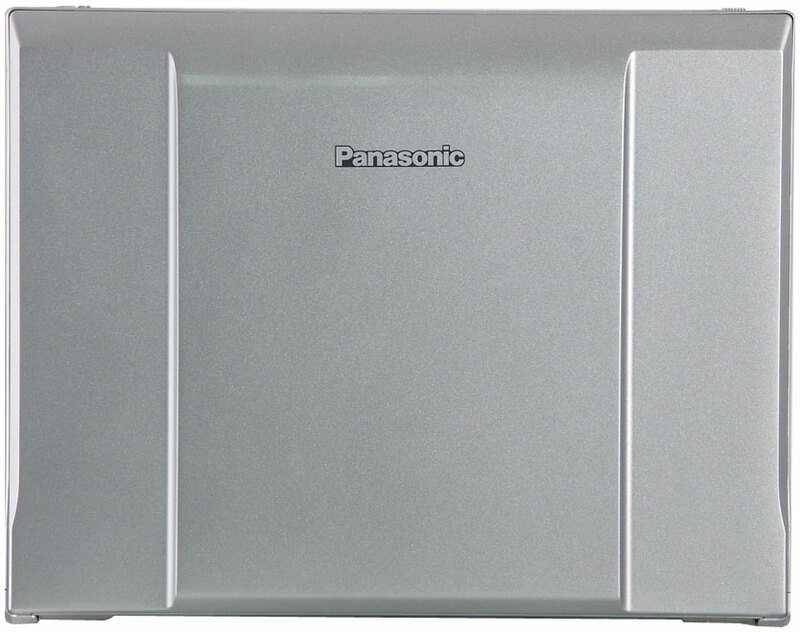 The right flank houses only PC Card slot and Kensington lock hole. Battery latches and a lid that covers memory modules are on the bottom. There are no air vent holes for the processor. On the whole, the set of ports is minimalist. But if you are not going to use the notebook as a desktop replacement with external mouse and keyboard, then two USB ports should be enough. No IEEE1394 port may become a critical issue, though. First of all we should figure out how to open that lid. Two symmetric sliders suggest that we should use them to open the lid instead of a button in the middle. The lid is stamped with ribbing, which allows to make the notebook thinner. The first thing you notice when you open the lid is an original round touchpad. This solution is supposedly more convenient to use for scrolling. You scroll by moving your finger on the touchpad, not very original, isn't it? But you draw circles instead of moving your finger up and down. I've heard polar opinions about usability of such a touchpad. I can say that I liked it much better than the traditional design. 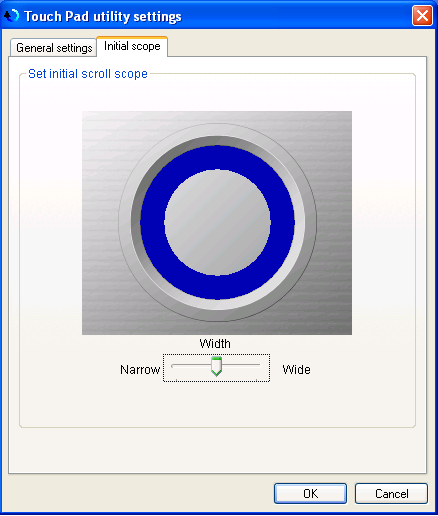 And the round shape of the pad is almost no problem to control the cursor. 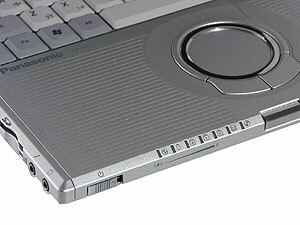 I don't like the other original design element — pop-up lid of the optical drive. First of all, the process of installing/removing a disc seems a tad less convenient than the traditional way. Secondly, the drive is very noisy, so disabling it seems a good option. The keyboard is almost as wide as the notebook. It's rather convenient, we can only hold a demand against the Enter button size — it would be better to be able to press it without aiming. All indicators are grouped into a single block in the fore left part of the notebook. The place is rather good, at least you don't block indicators with your hand. The indicators also show the battery charge level. To check up the battery charge, you should move the slider (as if you turn it on) with the lid closed and the power supply unit unplugged. The scale is non-linear. When all the LEDs are off, it means that the charge level is 0%-4%, one LED alight means 5-24%, and so on at 20% steps to 94%. All five LEDs lighting correspond to the 95-100% charge. But wireless activity is not indicated; there is also no hot key to switch it off — you'll have to do it on the software level only. Unfortunately, when we tested this notebook, our testbed for examining panels was not yet ready, so I cannot publish precise angles of view for this model. The antiglare screen subjectively reduces small enough viewing angles, typical of notebook panels. The major attraction of this notebook is its original design. In my opinion, it's up to users to decide how this original design goes with usability. I've just tried to deliver my impressions. This notebook uses a hard drive with reduced voltage (3.3V), so you'll probably have to resort to some tricks to replace the hard drive. You can read some tips on how to replace a drive on your own here. But this method has not been tested, so use it only at your own risk. 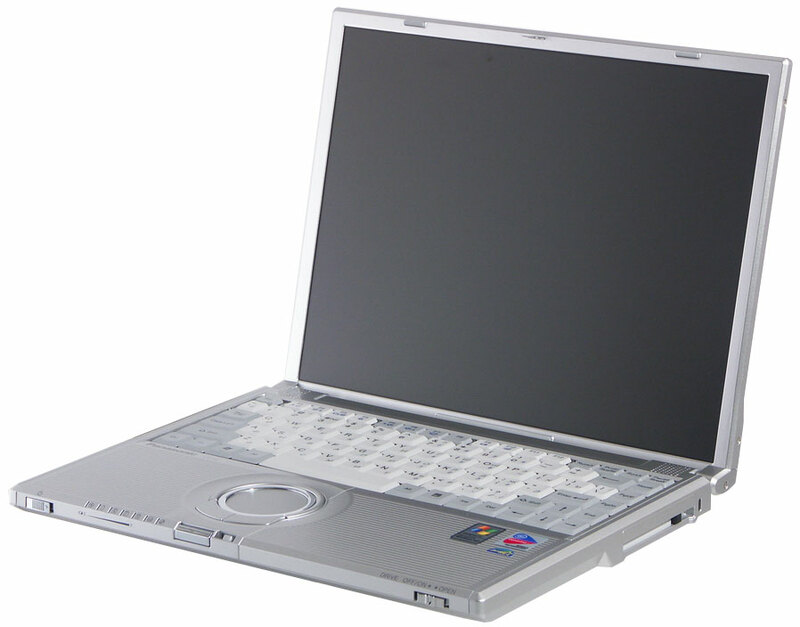 As soon as you have a look into the specifications, you will assume that the performance of this notebook will not be high, its battery life should be good, and 3D graphics is not this model's element. And our tests prove it. Panasonic Toughbook CF-Y2 is a notebook with original impressive design. 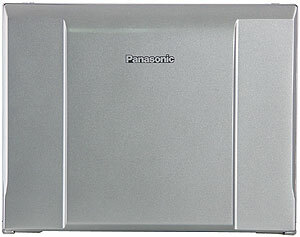 Durable case, shock-mounted hard drive, and long battery life make it a good companion when you travel or on vacation. But the notebook capacities are limited by the poor choice of ports, and to a lesser degree, by its relatively low performance. Another important factor is its price. Frankly speaking, this model is quite pricey.